Where to find Spruce Grove hotels near an airport? 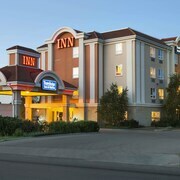 Where can I find hotels in Spruce Grove that are near tourist attractions? Are you arranging to spend some time in Central Alberta? Hoping to reserve accommodation in or near Spruce Grove? There are 6 Expedia-listed hotels within a 0.1-kilometre (0.1-mile) distance of its central area. One of only a handful of hotels within walking distance of the center of Spruce Grove is the Travelodge Inn & Suites Spruce Grove. You could also check out the Courtyard Edmonton West or the Edmonton Marriott at River Cree Resort. 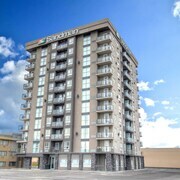 The Courtyard Edmonton West is situated 18 kilometres (11 miles) away from the center of Spruce Grove. The Edmonton Marriott at River Cree Resort is 15 kilometres (9 miles) away. 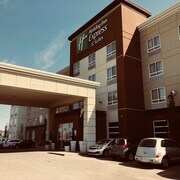 You could also choose to check out the rates and amenities at the Hampton Inn & Suites by Hilton Edmonton/West or the Wingate by Wyndham - Edmonton West. If time permits, you should visit other parts of Central Alberta. Nature lovers will love Central Alberta's forests and rivers. You could also head to the area's old towns, archeological sites and nature museums. Common pastimes in this particular part of Canada include snowboarding and skiing. Looking for more to do? Spend some time exploring the Multicultural Heritage Centre and the Stony Plain Golf Course in Stony Plain, 6 kilometres (4 miles) to the west of Spruce Grove. 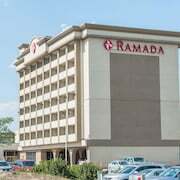 If you'd like to spend a few nights in Stony Plain, check out the room rates at the Best Western Sunrise Inn & Suites and Ramada Stony Plain Hotel and Suites. 20 kilometres (12 miles) to the northeast of Spruce Grove is St. Albert, home to the Best Western Plus The Inn At St. Albert and Sleep Inn Motel. The St. Albert Botanic Park and John E. Poole Boardwalk are just some of the more popular points of interest to see when visiting St. Albert. 25 kilometres (16 miles) to the east of Spruce Grove is Edmonton, a regional center with a population of 700,000, where you will find places to see like the University of Alberta, the Citadel Theatre and the Art Gallery of Alberta. The Rutherford House and Shaw Conference Centre are also well worth visiting. 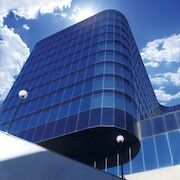 Edmonton has hotels and apartments to suit travelers of all kinds, including The Fairmont Hotel Macdonald and Fantasyland Hotel. Located 35 kilometres (22 miles) from Spruce Grove is Edmonton International Airport. Stay nearby at Best Western Plus Denham Inn & Suites or Ramada Edmonton International Airport. What are the most popular Spruce Grove hotels? Are there hotels in other cities near Spruce Grove? What other types of accommodations are available in Spruce Grove? Explore Spruce Grove with Expedia.ca’s Travel Guides to find the best flights, cars, holiday packages and more!